Guided walking tour contrasting numerous dwellings built for the poor. From 17C austere (still providing accommodation for six residents), picturesque housing of the Victorian era, to modern re-builds deriving from bygone bequests. A loose definition of almshouses is "charitable housing" a reminder of a time when the poor were somewhat reliant on individual benefactors. This tour takes in numerous examples from those surviving from King Charles ll's reign built for "six poore women" with a coat of arms of the principal benefactor at its centre, and the Victorian era, ranging from small dwellings for two couples to six ladies of limited means, to modern more spacious re-builds still reflecting the generosity and ethos of their various donors. Once each set had separate trustees and strict rules, inmates being providing with free accommodation, coal, clothing and in some cases a pension. Today all come under the umbrella of Isleworth & Hounslow Charity. 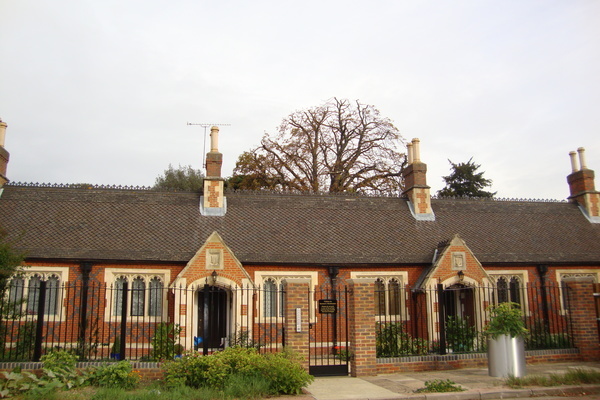 One set provides homes for 12 residents overcoming mental health problems, the first time in the UK almshouses have been used in this way.